A fun, free and educational family event returns to Hendricks County, Indiana, the first two Saturdays in March. Maple Syrup Days celebrates McCloud Nature Park&apos;s sugar maple trees and the delectable sweetness that they produce. Located just outside of North Salem in the northwest section of the county, McCloud Nature Park provides a glorious outdoor experience year-round with 232 acres of hills, prairies, trees, trails, Big Walnut Creek, wetlands, a historic truss bridge, open green space, wildlife and much more. Inside McCloud, hundreds of sugar maple trees are tapped every year as Hendricks County Parks & Recreation celebrates Maple Syrup Days. Since I work for Hendricks County Parks & Recreation, I&apos;m a pretty good source of insider information. 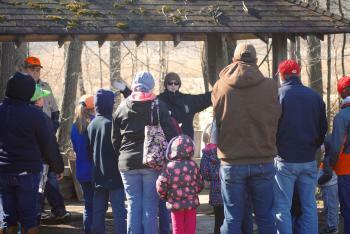 On each Saturday during Maple Syrup Days, our staff and volunteers are out at McCloud between 9 a.m. and 3 p.m., teaching visitors about some history behind maple syrup, dating back to the Native Americans and colonial Americans, as well as how maple syrup is made today. A couple weeks ago, we started tapping the sugar maple trees at McCloud that are bunched together in a group called the "Sugar Bush" area. You&apos;ll see our maple sugaring rigs still on the trees during Maple Syrup Days. We collect that sap in buckets that hang on the trees, and then use it to make McCloud Maple Syrup -- 100 percent all-natural sweetness. While you&apos;re out at McCloud for Maple Syrup Days, you&apos;ll have the opportunity to sample some McCloud Maple Syrup and even purchase a bottle or 10 to take home. Over in the campfire area by our new arboretum, we&apos;ll have a wigwam set up and some sap cooking over the fire as staff and volunteers talk about how maple syrup was originally made. Under the pavilion at McCloud Nature Park, you&apos;ll find our "Sugar Shack." In there, we&apos;ll have a modern evaporator and will explain how maple syrup is made today -- quite a stark contrast to how it was made in the early days! While you&apos;re standing in the Sugar Shack, you might notice a smell emanating from the Nature Center. It&apos;ll smell like...breakfast. 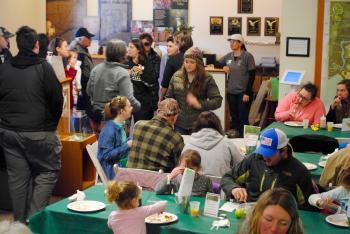 That&apos;s because the Parks Foundation of Hendricks County -- our not-for-profit fundraising partner -- is hosting its annual Pancake Breakfast Fundraiser from 8 a.m. to 2 p.m. on both of those first two March Saturdays inside the Nature Center. Stuff yourself full of as many pancakes as you can eat, topped with our famous McCloud Maple Syrup. Add a helping of sausage, fresh fruit, coffee and juice, and you&apos;ve got all the energy you&apos;ll need to explore Maple Syrup Days. Freewill donations are accepted, and all proceeds benefit Hendricks County parks! 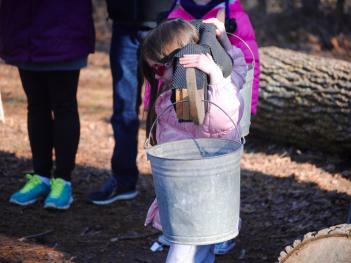 Bring the whole family out for Maple Syrup Days at McCloud Nature Park! It&apos;ll be a lot of fun, and I look forward to seeing you there! 8518 Hughes Road, North Salem, Ind. Click here to reserve a spot at the Pancake Breakfast Fundraiser! All proceeds benefit Hendricks County parks!